Loved the video you linked to, although I am a bit confused about two things. First, I'm wondering why extraterrestial beings, who apparently are sophisticated enough to travel millions of light years in a short amount of time (presumably...Einstien's theories on time and the speed of light notwithstanding...stop typing "haha" on your keyboard Dr. Hawking! ), anyway, why these sophisticated and advanced beings would choose to make such long, perilous, and complex journeys in what appears to be a giant beach ball. They should sit down with the chaps from British Airways and talk to them about their business-class service, the one with the foldout beds, gourmet menus, and the annoying commercials with the slack-jawed male model who can only say three words ("Good", "Night", and "Morning"). Nonetheless, if the UFOs are coming to pay us a visit, and take Louis Farrankhan, Ross Perot, and others back to the mother ship, I expect there may be a nice upswing in the tourist trade as these giant interstellar grapefruit flit from planet to planet. I mean, they're bound to want to cash in at some point on man's unquenchable desire to travel to lands and worlds beyond his own, so that he can declare just how inferior the WC (toilet) facilities on planet Praxis Gargantua are (where they use the insufferable bidet instead of proper chamberpots.) So I figure a nice three-month cruise of the outer rim of the galaxy would be in order. I intend to put the whole thing on my Visa card (an estimated 4,000,000 pounds - haven't figured out the Euros yet, as the bleeding things keep depreciating after the France vote on the EU Constitution), because, given Einstein and all that, a trip of three months for the family and I will last about 8,000 years here and Visa will have been replaced by then by the world-conquering force that I know you all, in my extended absence, will make this comedy blog. So keep up the good work, and see you in the Kingdom Come, should the travel plans go through! I promise to spend the money wisely and keep all your descendants on with the conglomerate. PS: Now I realize some people may think I am simply mocking this whole idea. This may be a diversion though. I may simply be planting this story to divert attention from the massive foul-up the boys at Nellis AFB have made with "Project Cue Ball" (and ensure my travel plans, via the U.S. Air Force, courtesy of the Project Blue Book frequent-flyer miles program, whether I want to go or not...) I'll leave it to discerning minds to figure out. If I go missing though, assume my tickets have a departure point somewhere in Nevada. It finally happen. Ever since I was the little Juan Carlos in my homeland sitting around with the flies biting, I was imagining in my head how was going to be the future. Yes, I see the various movie what showing how the future going to be, like this one and that one which are both completely plausible extrapolations of the way things are going even right now as we speak. But when I sitting to think about the future ever since my tiniest days, I one thing primarily came to mind, one powerful development that I was certain would come to pass. Yes, you know what I am talking about. Whenever you think about the future, what is the one single thing that comes to mind? The apocalypse and the world being destroy by God's judgment? No, no, not that. I am talking about the other thing, yes, the other single thing that comes to mind when you think about the future of man. Yes, that's it. The ability to summon UFO's on command. Of course, of course. We always knew the day would arrive, and the future is now! Yes, now! Hey, that was a hint for you to click on the now and see the future. Well, it looks as though Clive got this one wrong also. This photo would seem to be the clincher. 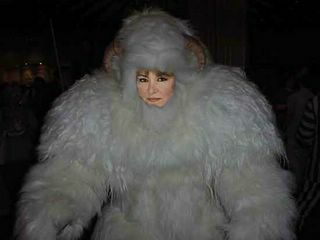 However, upon closer inspection, it is in fact a yeti wearing a well designed Roseanne mask. Roseanne's current look can be found here . Whoops! I'm sorry, I meant here. Into the busy summer movie season comes, The Sisterhood of the Traveling Pants, a soppy, hokum story of four girls who find a magical pair of pants which they share with results that only magical pants found at a secondhand store can bring. Now, I'm sure it's a fine story of post-adolescent girls having a coming of age experience brought to us through interesting vignettes full of intrigue and international travel, but it's certainly no Rashômon. However, it did make me curious to see if any other garment related movies were on the horizon. I pulled out the Great Big Book of Soon To Be Released Movies and here is what I found. A Truss Grows in Bettendorf - The Fred Garvin Story - Starring Dan Ackroyd, it's the story of everyone's favorite male prostitute from the Quad Cities - Moline, Rock Island, Davenport, and Bettendorf. Fred wins our hearts while wearing an elaborate network of trusses and striking some seductive poses. Harry Potter and the Uncomfortable Underpants - An incantation gone wrong leaves young Harry (played by Daniel Radcliffe - Age 29) stuck in a pair of burlap drawers. Is it the mysterious Sirious Black or the evil wizard Lord Voldemort who hold the secret to getting our "young" hero back into a comfortable set of undies? Find out in the tenth installment of the series Harry Potter and the AARP Membership starring Wilford Brimley as Quizenart the wizard of pensions and the social security. Star Wars - Episode VII Return of the Jedi Knee-highs - This is the story of an aging Luke Skywalker who is forced to wear orthopedic stockings due to a bout of the varicose veins. Luke must summon the strength of The Force to get over the embarrassment after he is locked out of his hut while getting the mail in his robe. The Man Who Knew Too Much...about Fashion - Starring Carson Kressley this is a remake of the Hitchcock film starring Jimmy Stewart and Doris Day of the remake of the Hitchcock film starring Leslie Banks and Edna Best. The update of the story concerns the kidnapping of Carson's toy pekinese Mister Cuddles after Carson pans the footwear choice of the Ayatollah Khamenei on national television. True to the original story Carson hires bounty hunter and celeb du jour Duane "Dog" Chapman to hunt down the whereabouts of Mr. Cuddles and kick some serious Iranian backside in the process. In the end Mr. Cuddles is returned after the Ayatollah is touched by a soulful, albeit raspy, rendition of "Que Sera, Sera" delivered immaculately by "Dog" Chapman. Eighth-grader Anurag Kashyap of California was crowned the winner of the 2005 United States National Spelling Bee after spelling the word "appoggiatura". Later however, it was determined that this word doesn't actually exist in the English language and that it is actually Italian for "swissle stick". Poor Anurag was recalled and forced to spell the English version of the word. Unfortunately he spelled the word stick "S - T - I - K" and was disqualified, handing the championship to this man, who correctly spelled the word "frog". A new study indicates that parents can help their children get rhythm by bouncing them on their knee or dancing around with them. What happens though, if the parents themselves are rhythmically challenged? Apparently scientists indicate that those children can make a living out of being failed American Idol contestants. That article caused me to produce Greenhouse gases! The article that prompted Earl's post yesterday had me fuming, but not at Radiohead or any other non-"carbon neutral" bands. First of all, it's about as silly as saying Blue Man Group is not environmentally sensitive since they haven't changed their name to Green Man Group but also, look at who's calling the kettle black. The Sunday Times has probably wiped out more trees in a fortnight than Radiohead will if they continue to make albums into their nineties. This prompted me to jump on the Concorde and make my way to jolly old London town to confront the editor in chief of The Sunday Times, Sir Clive Lionel Clive Kensington at his posh flat in Chelsea. After several hours waiting for a Concorde to arrive I was informed by the janitor that it doesn't fly anymore so I jumped on Virgin Atlantic. I did quitely break some crockery to both show my disgust with The Sunday Times and my commiseration with Peter Buck. After a few days, and several canings, I was able to post bail with a promise to return for court, and was off to interview Sir Clive. Stew: Sir Chive, I mean Sir Clive, are you aware of the article in The Sunday Times concerning the accusation that Radiohead is not environmentally sensitive? Sir Clive: Yes, quite smashing. A true bit of pluck by those boys in the news room, I fully expect a GBE for this work. Stew: Have you read the article? Sir Clive: Not... really. No. Do you have a copy? Sir Clive (scanning the article): Yes, mmm hmmm. Ah, the ECCM...very good. CO2? I'm afraid I'm not familiar with that. Stew: It means carbon dioxide. Sir Clive: Yes, of course it does. Mmmm hmmmm. Well it's obvious we've crossed our t's and dotted our i's here. Stew: But doesn't it seem like the pot is calling the kettle black here? I don't want to call you shallot, shallow, but The Sunday Times must produce many more times the CO2 not to mention all of the trees used for printing the paper. Sir Clive: I can assure you we have taken steps to remove all carbon producing entities from The Sunday Times starting at the very top. Most of my staff and I are composed entirely of vermiculite and through technology we hope to cut out the use of breathing entirely by next year. Furthermore, unknown to the general public The Sunday Times has been printed on a new fibre composed of Weetabix and Marmite and is entirely edible. Stew: None of that's true is it? Sir Clive: No, I panicked. Really it's all Rupert Murdoch's fault. You know it started after the Hitler Diaries fiasco and then when Rupert came along he wanted us to be more controversial so we started publishing these exposés. Stew: Leek... sorry, like the exposé saying that Fergie's weight loss was causing the polar ice caps to melt and that Liz Taylor adjusting her waistband had resulted in last year's tsunamis? Sir Clive: Yes, not to mention the one where Don King's hair was responsible for Soul Plane and that Roseanne Barr was really a Yeti. Stew: So all of those were fictitious? Sir Clive: Yes, except we're still not sure about Roseanne Barr. Stew: So you are willing to go on record that The Sunday Times has been irresponsible for publishing these stories? Sir Clive: Well of course, but first let me show you some papers I think that you will find very enriching. Stew: Are you trying to offer me a bribe? Sir Clive: Yes, is there anything wrong? Stew: No, just wanted to be sure we were on the same page, can I have one of those pearl onions in my martini, thank you. In conclusion let me say that The Sunday Times is a smashingly good tab and if anyone says otherwise they will have to take it up with me. I would like to thank myself...I mean Sir Clive for his precious time and am going out right now to renew my subscription. Cheerio. I knew their music was awesomely loud, but I had no idea it was causing global warming. Of course it should be obvious to anyone that a rendition of The Bends could melt an iceberg at close range on sheer energy alone. Still, if Radiohead's music is destroying virgin forests and raising the earth's temperature, just imagine the damage being done by Ashley Simpson or Britney Spears. Somewhere in the vast expanses of the universe lie entire planets that will instantly explode into dust, fire, and ashes when the transmissions of these young women's (ahem) "music" arrives. Millions of teenage alien beings will spend their final moments of existence twitching and gyrating convulsively through space to the excruciating, yet basic rhythms, amplified to obscene decibel levels and accompanied by the densely electronic filtered warbling of these two overhyped and underdressed showgirls. They'd be better off being eaten by that planet-killer thing from the original series of Star Trek. At least their eardrums wouldn't burst in merciless agony a few moments prior to their demise. I'm not even going to begin to dwell on the stars that will be annihilated when all the hip-hop bass riffs arrive. One of them, played from the speakers of a passing car, is enough to crack the very concrete foundation of my home from end to end. Give me Radiohead, U2, They Might Be Giants, and plant enough trees to get us to their next albums please. Greetings, Blancos Feos y Todos los Otros Feos, I know what you going to say even before you saying it. Yes, you going to say the question, "Whatever happen to that Juan Carlos Vega muy guapo that use to post the funny paragraph on this world wide famous website?" Well, if you determined to know everything, including that which is not your business like the daily activities of myself, then I will inform you that I have been travelling to a variety of cosmopolitan cities like Chicago, Illinois and El Pueblo de Nuestra Senora La Reina de Los Angeles de Porciuncula, California (what some shorten to LA), and Dallas, Texas and Bentworth, Wyoming and Ferrocarrill, Iowa and Preston, Idaho the hometown of my cousin Pedro Sanchez who is some kind of bigwig in that city like mayor or president. Anyway, so you are going to be the wondering person to say, "Why, Juan Carlos Vega, you travelling to all of these glorious goodtime city of America?" Well, to see the new Star Wars movie one time in every city of America, of course. What else? I mean, how else can anyone ever truly satisfy the George Lucas but to do this? And if I do not satisfy the George, he never going to purchase my screenplay Horses, At Rest and Play, The War Effort, Episode I starring Liam Neeson and Daniel Devito as the horses Roger and Schumtpypoo. Okay, all of that to say this part here. The top five Star Wars, Episode the 3, the Sith what are Revengeful Getting to Jedi, moments from that movie, as decided by a panel of experts comprised of Juan Carlos Vega. 5. That one lady what is pregnant want to be hugged like a person beside the lake on Naboo, which was a touching line of the dialogue for me. She say, "Hold onto me, like as unto that one time you hugged onto me beside that lake where you didn't like the sand." 4. The same one lady dying for no reason. Man, this is so great and teach me a lot about how to write the screenplay, because many time I wonder to myself, I say, "Juan Carlos, I want this certain character to die, but I cannot figure out the logic to make it happen." So from now on I will just have the one character in screenplay to say, "Well, he/she die for no reason, just because wanting to die." That make it so easy. I want to cry upon the shoulder of the George for happiness. 3. The one guy get the arms/legs sliced off and cauterized and he scream. Well, this happen many times in movie, I guess, so I will lump all these scene together in one beautiful moment. When I first see original Star Wars movie as a little Juan Carlos in my homeland, I marvel at the scene where Obi Wan cut off the alien's arm in that one dirty bar, never realizing that the day would come when I get to see a Star Wars movie where cut-off arms and legs flying around like some kind of damp pasta being flung around the kitchen by angry children. 2. Yoda crawl through the ventilation shaft. Man, of all the type of scenes known to Hollywood, my favorite one is the kind where the main character escape/hide from villain by crawling through extra large ventilation shaft. This kind of scene good for any type of movie, not just James Bond or Mission:Impossible. Any character can hide in the ventilation shaft, and it happen in, I estimating, 25% of all movies. I am now include a scene in my next movie of Devito escaping from the Horse Eating Bear by crawl through ventilation shaft of Central Park. 1. The Seeping Ooze attacks El Pueblo de Nuestra Senora La Reina de Los Angeles de Porciuncula. Yes, this was a great scene. I think mayhap a tiny bit of the urine come out when I see it for the excitement (excuse for the graphicness, but it's true). When that tiny space rock land in La Habra and break open and the Ooze of the Dark Side come out and begin eating the people, I stand up in my seat and throw my wallet at the screen. Okay, so I am still compiling many lists about this movie. Somehow, I begin to think it contain all the answers to all the questions ever asked in the history of asking questions and getting answers to those questions. Anyway, I am off to Leebrookenfield, Ohio next to watch the movie at the Odeon Odeous Cineplexicon 24, then to Dippitydo, Vermont to watch it downloaded as crude mpeg on some guy's Mac, then to Mooselookmeguntic, Maine to watch the movie with Stephen King (he don't know it yet, but he learn soon enough) Until next time, happy viewings. Film industry observers were shocked to discover that at the end of the U.S. Memorial Day weekend, Star Wars, Episode III (Part VI), The Return of the Cloned Revenge of the Phantom Sith Empire Strikes Jedis was the film with the most box office receipts. "This is a huge surprise to us," stated industry insider I. M. A. Weasel, "We had no idea people would turn out for yet another Star Wars film, especially one where everyone knew the entire plot of the film, given that Episode IV was released 28 years ago." Others were also pleased with the news. Ewan MacGregor, who plays Obi-Wan Kenobi in the film, said, "I'm glad I saved all my talent and energies for George's film, rather than acting in the Harry Potter films or some cheap, worn-out science-fiction soap opera that has outlasted it's... oh, damn, what have I done?" He then repeatedly asked if anyone had J.K. Rowling's phone number. Irish actor Liam Neeson, who played Qin Jin Somethingorother in Episode I: The Return of the Profits said, "I couldn't give a flying bleep about it. (He actually used the word "bleep" which apparently means something really foul in Gaelic.) I got paid for the first load of rubbish and haven't given it a thought since then, except when I drive around my 10 Hummers that I bought with the salary." Natalie Portman, who played Mrs. Darth Vader in the series, stated that she was really pleased with the film's success and "looking forward to acting in the sequel." Andromeda much bigger than previously thought! Scientists have discovered that the galaxy of Andromeda is as much as 3 times bigger than what they previously thought. An official press release from the American Astronomical Society stated that scientists are now absolutely certain that the galaxy is "between the size of 220,000 light years and a really large breadbox." When asked what caused the error, an unnamed source reported that "someone forgot to carry a two in calculations 25 years ago and we've only just now spotted the error." Scientists state that this has set back their plans for a sightseeing tour of that galaxy. "It was going to take around 80,000 years, based on our original calculations, but this has set us back another 160,000 years." stated an unnamed astronomer at an observatory in California. "Even with the whole theory of relativity things slowing down time, that still leaves most of us dead before we've gotten on the interstate, so to speak." Combining the last two columns produced the "non" result. Chirac described the result as "Harsh, especially considering I don't even like brie." The German government responded to the French vote by stating in a press release, "This is just an attempt to get us to invade again. Like that'll happen!" In Brussels the response was more predictable. The government immediately resigned and stated that it would await orders from Paris before proceeding further. Then they all stepped out for steak and frites in hollandaise sauce.